* Kath & Kim broadcast 9:00-9:30pm in Perth. Best Backyards, Hot Property, My Name Is Earl and Torn pre-empted in Perth due to annual Seven Telethon. Anyone seen the SBS doco “Is your house killing you? Wednesdays 7.30pm? What are the ratings like? Weekend figures are harder to acquire, I will try to update with info at a later point. Saturday seems like a good day for the ABC, would it be possible to see how the ABC fared overall with the evening shares? Geez, even Ghost Whisperer outrated Bionic Woman. Such a shame, i think this is a great show. what a dud of a night, if the highest rating show was Today Tonight! and Heroes, such a brilliant show, fast tracked but under a million! I really hope this does not make Seven re-think their fast track strategy, because the figures are lower than the 1.1 million it used to average towards the end of last year. Seven’s luck run out at 8:30pm, and ratings run til Midnight. Nine moving Damages turned out to be a strategic move, with Without A Trace rating higher. 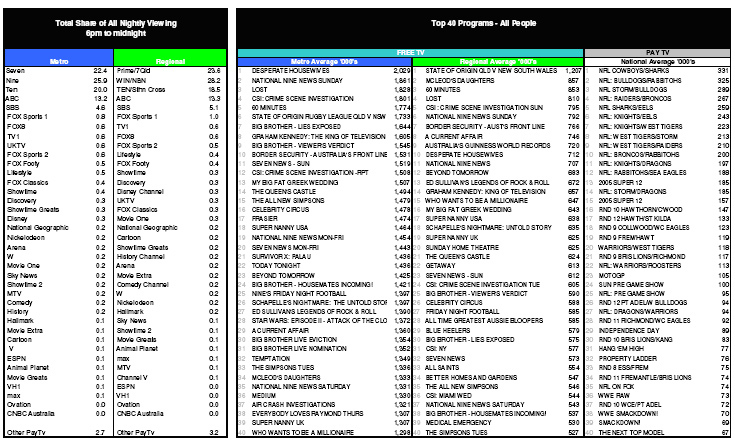 How can channel 9 be higher then 7 overall on Wednesday night? Just wondering if Newstopia fared any better this week? i dont mind spin…..but at least spin the truth. It’s called spin, and that’s why those blurbs are never published in TV Tonight. You should see the TEN spins. Where do 7 get there figures from for their Daily Ratings Reports? I know you dont work out the figures but id like to know how they do. Do you have the ratings from Telethon?